Edwina Currie has a lot to answer for…. Despite knowing that eggs are healthy and packed full of nutrition I don’t eat them nearly as often as I might. 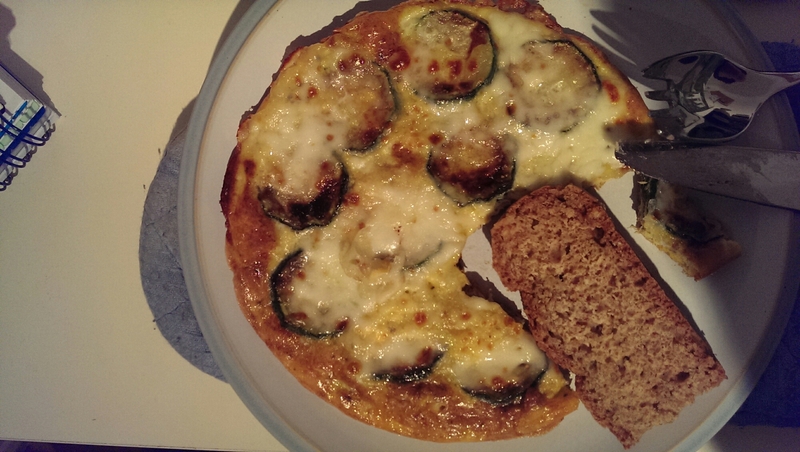 But this frittata was delicious and reminded me that I enjoy eating eggs. And of course cheese makes everything better. Served with soda bread. Soften a courgette chopped into chunky rounds slowly in some olive oil. Add beaten, seasoned eggs and cook until the base is set. Transfer the pan to below a preheated grill. When the top has set slightly add sliced mozzarella and grill until bubbling. The eggs were undoubtedly overcooked! I’m also going to link this to Dom’s new Linky, Simply Eggcellent what with eggs being the principle ingredient of this dish!